Skywatcher Aleksandr Yuferev captured the first partial solar eclipse of the year through smoke from a chimney in Russia. The eclipse was visible from Europe to North Africa, Middle East and central Asia. 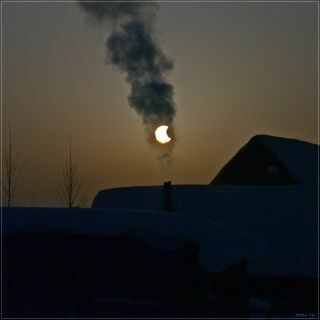 This photo of a solar eclipse looks all the more magical when seen through chimney smoke from a home in a Siberian village near Novosibirsk, Russia. Skywatcher Aleksandr Yuferev took this photo of the partial solar eclipse on Jan. 4, 2011. This partial eclipse was the first of four to occur in 2011, and it’s rare to see so many within the same year. According to NASA, 2011 has a rare combination of four partial solar eclipses and two total lunar eclipses. The last partial solar eclipse was on Nov. 25, and a total lunar eclipse is coming up on Dec. 10. During a total solar eclipse, the moon completely covers the sun's rays, causing a brief moment of darkness during the daytime. In a partial solar eclipse, the sun is only somewhat blocked out by the moon's shadow. The full shadow of the moon is called an umbra, and the partial shadow is called a penumbra. Skywatchers should take extra precautions when viewing an eclipse. Looking straight at the sun, even if it's partially covered, can be extremely dangerous to your eyes. Protective glasses specially designed for this task must be worn at all times. Never stare directly at the sun. Eclipses, especially a total solar eclipse, are rare events because the orbit of the moon is tilted slightly so it passes either above or below the line between the sun and Earth. Capturing the photo was just as much of a chance event for Yuferev. "I was somewhat late to be on the spot on the bank of our river (Berd, near Novosibirsk, Siberia, Russia) because I was chewing too long my bread-and-butter and drinking tea in my warm izba (wooden house), having known about the difference of temperatures between the room and open air which was equal to -65 degrees Celcius," Yuferev wrote in an email. "And as I was late I tried to gain my chances in capturing the phenomenon halfway."